Acer’s Black Screen of Death hitted mini-me! Do you own an Acer Aspire One computer? If so have you ever heard of the ‘the black screen of death’ ? Well I own one (mini-me) and until today I haven’t heard about it, let me tell you what happened I how I pulled my self out of it. 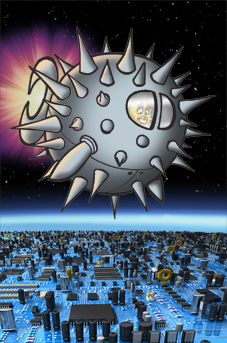 During this afternoon I was playing with OpenBSD on my little Aspire One and things were looking pretty normal. However, after a reboot the little netbook just didnt came back not even turning on its screen! After some frustration and few small troubleshooting (first blaming the battery and so on) I was getting into a point of taking the poor thing to repair with no hope at all that it would come back. Well, let me tell you, it all changed after I saw a post here. Thanks Eric Chromick for it! I wont re-post it here and his instructions are pretty straight forward and indeed brought mini-me back from the dead! So if you are an Acer Aspire owner, dont get desperate! Just follow his instructions and you should be fine1 Now as for Acer, why the HECK is this happening? Note: After this close-to-death experience little brave mini-me was renamed mini-me-redux! → Santa Claus goes High Tech!